Protesters and security forces clash at the Egyptian presidential palace as thousands rally against President Mohammed Morsi. Protesters and security forces clashed at the Egyptian presidential palace on Friday, as thousands of people rallied in cities across the country against President Mohammed Morsi, AFP reported. The Republican Guard appealed for calm as demonstrators hurled petrol bombs over the palace walls and security forces responded with water cannon and tear gas and troops fired warning shots into the night sky. Egypt's official MENA news agency quoted a Republican Guard statement as saying protesters had tried to enter the palace grounds. Police then advanced on the protesters in armored vehicles, firing tear gas. People took to the streets in a show of opposition to Morsi and his Muslim Brotherhood, after a wave of deadly unrest swept the country last week in the worst violence since Morsi was elected president last June. AFP reported that protesters marched through rainfall towards the capital's iconic Tahrir Square and the presidential palace, chanting "Freedom!" and "Morsi is illegitimate!" Scores of protesters skirmished with riot police several hundred meters from the square, witnesses said, and two were wounded by police. The clashes were less intense than in last week's unrest which resulted in 56 deaths, mostly in Port Said, where violence erupted after 21 residents were sentenced to death on Saturday over soccer-related violence a year ago. Thousands of people protested in the canal city on Friday calling for Morsi's removal, unfazed by a strong military presence, and similar marches also took place in the Mediterranean port city of Alexandria. The opposition National Salvation Front (NSF) joined rival factions on Thursday in condemning violence and supporting efforts for a national dialogue. 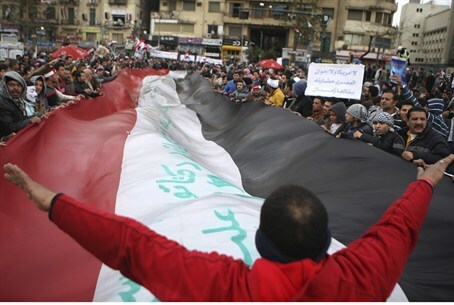 But the coalition of mainly liberal and leftist groups also called Friday's protests demanding a unity government and amendment of the Islamist-drafted constitution which polarised the nation when it was passed in December. The opposition accuses Morsi of betraying the revolution that toppled president Hosni Mubarak two years ago and took him to the presidency. In a statement quoted by AFP, the NSF said Egyptians would demonstrate nationwide against "a regime that seeks to impose its will on the people and is managing the country in the interest of the Brotherhood." The crisis has sapped the popularity of Morsi -- who won the June election with a slender majority -- and complicated negotiations for a crucial $4.8-billion IMF loan that could help bail out the teetering economy. In the wake of the riots, Morsi declared a state of emergency on Sunday and placed three cities under curfew because of rioting – Port Said, Suez and Ismailiya.